Chase had surgery yesterday to remove a lump from under his arm. He's now under close supervision for the next couple of days so he doesn't pop his stitches. I made him comfortable on his bed, brought him water, food, some treats - whatever he would need to keep him happy and resting throughout the day. Logan didn't seem to be amused by all the attention his Dober-cousin was getting. He stood in the corner and watched me pour all my love and attention to Chase. Then all of a sudden, Logan started limping. I checked under his paws, in case he had something stuck and found nothing. Soon, he started holding his back leg up off the ground and then refused his dinner (which didn't surprise me as he has always been a fussy eater). I checked his pads again, gently massaged his legs and decided to give it another day before calling the vet. This morning, he continued limping in front of me. But the funny thing is, hubby said Logan walked fine when he saw him. Hmmm... was Logan faking an injury because he was jealous of my extra attention to Chase? 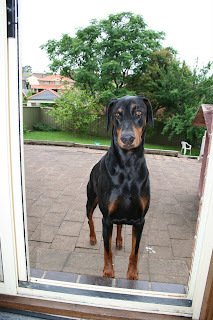 I decided to test it out - I watched Logan slowly limp across the kitchen and out to the backyard. I then sneaked upstairs and looked out from the window. Surprise, surprise - Logan had not only stopped limping, but he was also happily chasing the birds off his kennel! But wait, there's more - I called him from the window, he looked up and saw me, and then limped to the kitchen door! !